Charles Green began working in his parent’s small business at age 8 and attended many “board meetings” around the dinner table. Today he is a recognized small business authority with over 30 years of advising, financing and investing in entrepreneurs. He consults with business owners and bankers, writes about financial topics and teaches finance through seminars and conferences. Charles authored several books and articles about business financing including bestselling The SBA Loan Book, 3rd Edition (Adams Media) and Get Financing Now (McGraw-Hill). 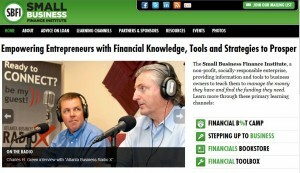 Small Business Finance Institute (http://www.sbfi.org/), is a non-profit, socially responsible business education enterprise with the mission to teach small business owners how to manage the money they have and find the funding they need. Based in Atlanta, the institute aspires to provide a national training platform to enable entrepreneurs to succeed with better financial skills, tools, and funding. MO: How did your early exposure to the family business influence your interest in helping and supporting entrepreneurs? Charles: I listened to my parents discuss the trials and tribulations of dealing with the buying public, and facing the challenges of being in business. They ran a dry cleaners in the 70s, and when the OPEC oil embargo struck, the price on their cleaning solvent tripled overnight. Their customers weren’t going to stand for raising the price of cleaning a pair of trousers that much, so my parents had to manage this situation carefully. From all those years, I learned about perseverance, patience, and the rules of dealing with a customer, who is always right. Capping 30 years of experience, I reflected on how much of my career was spent consulting with clients in addition to financing them – they needed a lot of basic coaching on finances 101. Many made mistakes based on short-sighted advice intended to benefit the advising party, and worse, I slowly recognized that there were few, if any, resources available to them other than experience, which could be very expensive. MO: What would be your advice for new companies looking for funding? Charles: 1) “funding” isn’t always going to be cash, it may be resources of a different kind; 2) funding must start from your own back pocket – if you don’t have any real skin in the game, don’t expect anyone else to be willing to commit much to you; and 3) it’s not going to be common that you get all of the resources you need from just one source – there are many niche investors and lenders who will manage part of your needs, but few that will cover everything. MO: What are some of the most common mistakes you see businesses make and how can they avoid them? Charles: So many business owners are clueless when it comes down to understanding the basic metrics of their business performance. They don’t know how to read a financial statement, or draw anything else from them other than the cash position and net profit. Trying to run a business by monitoring your checking account balance does not tell you how well (or how badly) the business is doing. Charles: Plenty of mentors – both bankers and clients. We can all learn something from every day, and I preach for my clients to open yourself to figuring out something new everyday. BTW – read more. I’ve been a daily reader of the Wall Street Journal and a newspaper every day since I was in middle school. MO: Can you tell our readers about the new weekly webinar series that you’re launching in April? MO: What’s the most important advice you could provide in advising ways a small business can better manage their money? Charles: Learn more about your business than anyone else, particularly the funder, before you pitch your deal , and consider their perspective when preparing to make the “ask.” If they read more from the numbers you hand them than you obviously know, it will lower your credibility with them.